(UPTOWN CHARLOTTE, NC) - The Charlotte Business Journal named the Charlotte Knights among their inaugural Heavy Hitters Commercial Real Estate award winners earlier this week. The Knights were honored with the Economic Development Award for New & Existing Industry and the Top Hospitality/Entertainment Development Award. Members of the Charlotte Knights staff will accept the awards on Tuesday, Oct. 28 at The Ritz-Carlton, Charlotte. "We are very honored to be the recipient of these prestigious awards," said Charlotte Knights Executive Vice President, Chief Operating Officer Dan Rajkowski. "We are very proud of BB&T Ballpark and very appreciative of the support we have received from the Greater Charlotte Region and our fans throughout our inaugural season." The awards honor the best commercial real estate deals and developments across the region from June 30, 2013, to July 1, 2014. The winners were selected by a panel of industry experts working in combination with the Charlotte Business Journal staff. BB&T Ballpark, which opened its gates on Friday, April 11, 2014, was the most visited Minor League Baseball venue this season. Including the Triple-A National Championship Game, the Knights welcomed 696,601 fans during their inaugural season in Uptown Charlotte -- leading all of Minor League Baseball in attendance. 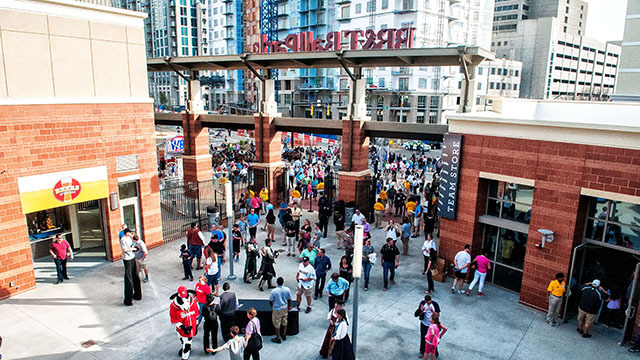 The ballpark also welcomes thousands of additional guests year-round with events such as Charlotte BeerFest, the Toshiba trade show, and the City of Charlotte's Back To School Day. The Charlotte Knights will begin their second season at BB&T Ballpark on Thursday, April 9 with their 2015 home opener against the Norfolk Tides (Triple-A affiliate of the Baltimore Orioles). Season tickets are currently available and fans can purchase tickets online at charlotteknights.com, by phone at 704-274-8282, or in person at the BB&T Ballpark Ticket Office.